Sarah graduated from Birmingham University in 2003. She worked in general practice in Lichfield and Birmingham before joining us at both practices in 2005. She completed her MFGDP(UK) in 2005. Sarah enjoys providing family dentistry, especially to children and nervous adults. She has a particular interest in working with patients on the autistic spectrum and those with sensory processing differences. When she is not at work Sarah is kept busy by her 2 very energetic young boys. 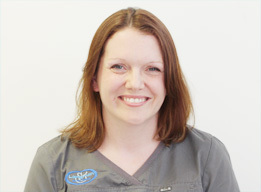 Sarah currently works 2 days a week at our Wellesbourne practice.